In certain situations, student loan lenders might allow you to stop making payments temporarily. This is known as a deferment. A deferment this gives you some time to get back on your feet without defaulting on a loan and damaging your credit. A deferment is a temporary arrangement which allows you to postpone your loan payments. Any payments you miss will be added on to the back of your loan. Depending on the type of loan you have, interest costs might be added to the loan, or those interest costs will be paid for you. If you’re having a hard time making payments, speak with your lender about your options. Deferment is just one of several options, and it might not be the best choice. Lenders will require that you qualify for deferment and submit an application before you stop making payments. Participation in a career-related internship or residency program. Again, speak with your lender. You might qualify for assistance that is not shown on this page. You don’t have to make loan payments in deferment, but that doesn’t mean interest stops accruing. If you have subsidized loans, the federal government will pay your interest costs, so you’ll only have to make up your missed payments at the end of your loan term. If your loans are not subsidized, you’ll be responsible for interest costs. If you like, you can pay interest costs each month as interest is charged. This is the ideal way to handle interest and will cost less over the long term. You also have the option of letting those interest costs be added to your loan balance or “capitalized.” In that case, you’ll owe more after your deferment ends. Forbearance: Like deferment, forbearance allows you to temporarily suspend payments. It’s easier to qualify for, potentially based on your monthly payments relative to your income (if your payments take up at least 20% of income). Unfortunately, interest will continue to be charged on all loans, including subsidized loans. Alternative Repayment Plans: ARP's can also give you some breathing room. Instead of making the same monthly payment, you can consider stretching out your payments over a longer period, basing your payments on your income and setting up a schedule of gradually increasing payments. If you take this route, remember that you might pay more in interest over the life of your loan. Loan Consolidation: Loan consolidation might also result in lower payments, especially if you opt for a longer repayment period. A Change in Your Payment Due Date: Sometimes, changing the due date of your payment can make things easier (time it so that you get paid shortly before your payment is due). Credit Counseling: A certified consumer credit counselor might help you gain control of your debt. If your loans are federal student loans, your odds of getting relief are much better. 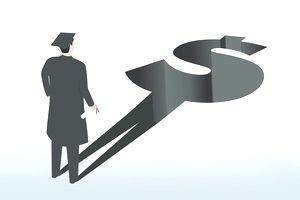 With private student loans, deferment might still be available, but the process is less straightforward. Although money is tight, it’s important to keep making your payments until your request for deferment is approved. Don’t assume that you’ll qualify and stop paying. Make sure that you're qualified and get your deferment finalized before you discontinue making payments.